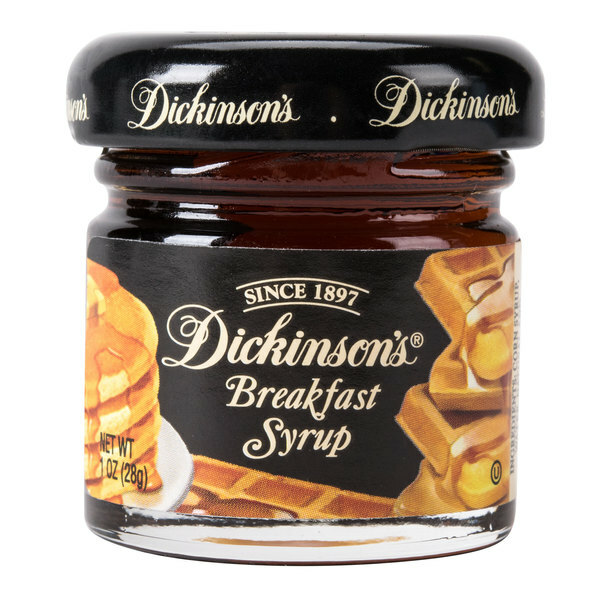 Indulge your guests with the classically sweet flavor and outstanding quality of Dickinson's breakfast syrup. Since 1897, Dickinson's has been the leading American brand of gourmet preserves, syrups, and honey with its "American Gourmet" character, premium varietal fruits, and pure, high-quality ingredients. Whether you're serving a towering stack of pancakes, waffles, or other signature breakfast dishes, this rich syrup is the perfect complement. This syrup's delightful sweetness, traditional taste, and smooth consistency makes it a deliciously indulgent accompaniment to a variety of breakfast services or in-room dining. Served in a sophisticated 1 oz. 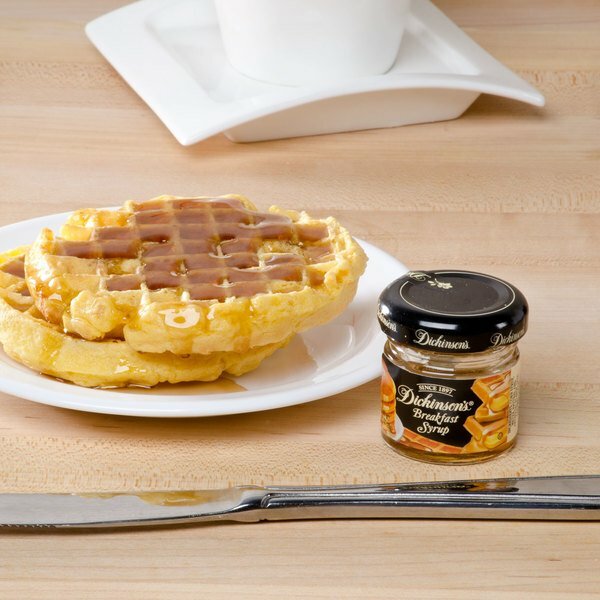 glass jar, this pure maple syrup will take your breakfast presentation to the next level. For your customers' convenience, these jars come in 1 oz. portion sizes, containing just the right amount of syrup to top your signature breakfast offerings. In addition to being easily disposable and pre-portioned to the perfect serving size, this syrup is contained in tightly-sealed glass jars, which extends the shelf life of the syrup and also helps to maintain the delightfully sweet taste and superior quality. The simple and stylish graphics of the syrup's jar are sure to complement a variety of settings, from casual to upscale. 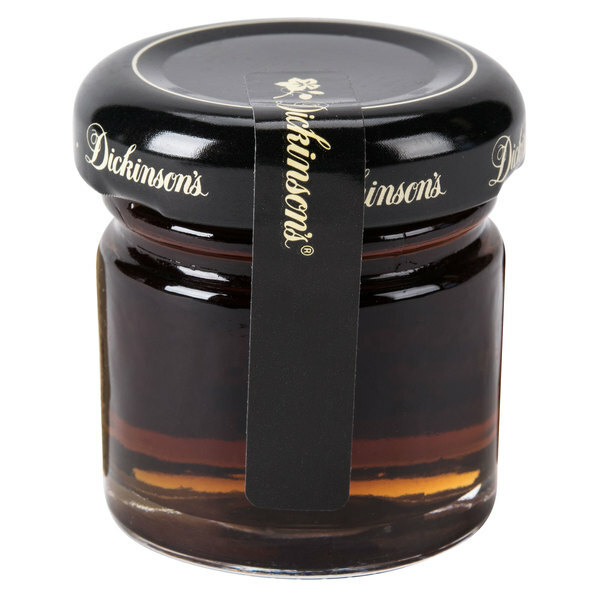 With its single-serving glass jar and elegant design, Dickinson's breakfast syrup glass jars are a must-have addition to any diner, restaurant, breakfast bar, or hotel room service. The breakfast syrup is great and the mini glassware make warming them so easy. A great syrup to pair with our pancakes and waffles at our bakery. Good stuff, yum, Dickinson's makes the best stuff, I tell you what. I've tried their strawberry coastal preserves (delicious) their grape preserves (divine as well) and now this WOW probably the best syrup I've had, truly, you need this in your life! I love this syrup. I have to say it is probably the best syrup in the entire world. I have reordered these mini jars for my businesses many times. The Dickinson's breakfast syrup tastes great and is so cute in the one ounce jars. The syrup is great for our breakfast baskets and for our catering events. Dickinsons 1 ounce breakfast syrup. When delivered will arrive 72 jars in the case box. The syrup is perfect for putting on waffles steak fries and pancakes utilize the syrup for many recipes. The perfect size container of syrup that is great for individual use. It is great for breakfast buffets and brunches. The breakfast syrup is a nice value and has a great buttery taste. These are the most classy single portion jars of breakfast syrup ever. We love them and use them at all of our catering events. The syrup tastes great as well. This is not maple syrup but for people who like "fake" syrup this is delicious. I am one of those people and the jar makes my pancake experience feel more classy. These are good to hand out for individual use. They are cute, They are also good for adding to food gift baskets. Making your own means you can make them look even more expensive than they really are, and this product helps. If the taste wasn't good then it wouldn't be a bargain. The taste though is good. Cute little jars. Perfect portion for one person. Adds a little elegance to a romantic setting for our B&B guests. Quality and appearance are great.